ANUPGCET 2019 PG Entrance Tests Notification, Application Form, Exam Dates, Eligibility, Syllabus ANUPGCET 2019 : ANUCET 2019 : Acharya Nagarjuna University PGCET 2019: ANUPGCET - 2019 ACHARYA NAGARJUNA UNIVERSITY COMMON ENTRANCE TEST Conducted by Acharya Nagarjuna University, Guntur For Admission into Postgraduate Courses of Acharya Nagarjuna University, Guntur and Andhra Kesari Tanguturi Prakasam University, Ongole for the Academic year 2019-2020. ANU invites online applications from the candidates who have passed or appearing for the final year examination in the qualifying degree for admission into Post Graduate courses as listed in its website (www.anu.ac.in) leading to Post-Graduate degree in M.Sc., MA., M.S.W., M.Com., M.H.R.M., M.Ed., M.P.Ed., PGDAS., P.O. Diploma in Yoga., 5 Years Integrated Courses in M.B.A. and Nanotechnology for the Academic Year 2019-2020 offered by Acharya Nagarjuna University Campus. PG Centre, Ongole and its Affiliated Colleges through ANUPGCET-2019. Common Entrance Test for ANU PGCET 2019, ANUCET 2019, ANU PGCET 2019, Acharya Nagarjuna University PG Entrance Test 2019, Online Application From, Fee Details, How to Apply, Last Date, Entrance Exam Date, Hall Tickets, Results, ANU PG Admissions 2019 Counselling Dates/Schedule details available here. 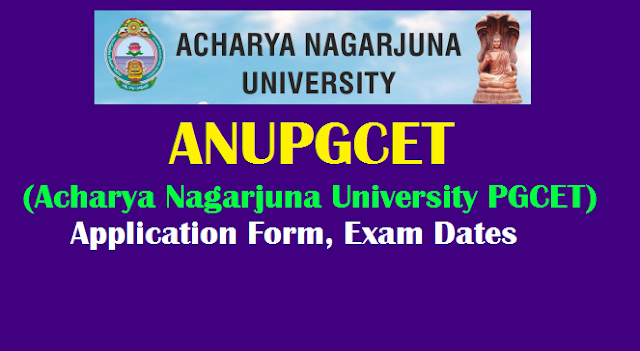 ANUPGCET 2019 entrance exam, also known as Acharya Nagarjuna University Post Graduate Common Entrance Test is a state level exam that will be conducted by Acharya Nagarjuna University (ANU), Guntur from 01st to 03rd May 2019. Online applications are iniviting from eligible candidates from 01-03-2019. Apply online up to 20-04-2019 without late fee. More details are given in the notification available at http://anudoa.in/Default1.aspx?cet=ANUPGCET . Admission into PG Courses offered by Acharya Nagarjuna University and Andhra Kesari Tanguturi Prakasam University affiliated PG Colleges for the Academic Year 2019-20 will be made for the courses mentioned in below are based on entrance test. NOTE: Candidates who are appeared and qualified in ANUPGCET-2019, they alone are eligible for Fee Reimbursement provided, they fulfill all other conditions of Govt. of AP Rules for Reimbursement. The Candidates are required to read the following Instructions carefully for filling the Online Application Form. Admission into PG Courses offered by Acharya Nagarjuna University and Andhra Kesari Tanguturi Prakasam University affiliated PG Colleges for the Academic Year 2019-20 will be made for the courses mentioned in Table – I are based on Entrance Test. How to apply: Eligible candidates apply through online mode at University website. (b) ANUPGCET – 2019 Information Brochure. 3. Open the website http://anudoa.in from your browser(Internet Explorer / Chrome / Firefox). 4. Click on the link appearing as Click here to register for ANUPGCET – 2019 Online Application. with elective subjects, then you will find the list of eligible and not-eligible courses. of birth. Please fill the details as per SSC or equivalent certificate. and Email only, No postal correspondence will be made under any circumstances. immediately your screen will display a message as “VERIFIED” in green color. payment of fee in bank, you will get a mail with all the details submitted by online as a PDF file.